The legacy continues after many millennia. Hello Pojo Readers, Crunch$G back here again to tell you about what you should know about a new Yu-Gi-Oh product release. This time around, I will look into a new Duelist Pack like set, and the second of its kind, Legendary Duelists: Ancient Millennium. This is mostly a legacy support set, and said legacy support is what really carries this set mostly, so I will discuss the legacy support and let you know about it. This is not a set for competitive players in all honesty, so just know that before reading the article. These sets are perfect for the casual player base, though, so without further a-do, lets take a look at this set. 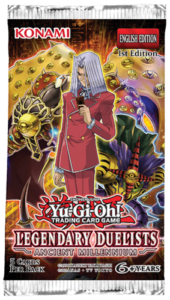 The first set of legacy support, and the main focus of this Legendary Duelists set since Pegasus is on the cover, is the support for Relinquished. Sadly, there is no Relinquished retrain. Yes, Relinquished is already a great card, but I would of still loved to see them try to make it better. We did get a Thousand-Eyes Restrict retrain, and one that does not require Thousand-Eyes Idol as material. 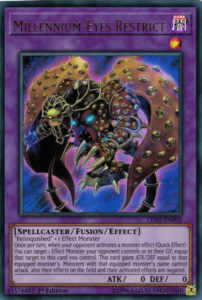 Millennium-Eyes Restrict is a great new Fusion Monster to equip to itself opponent’s monster when they use a monster effect, it is one at a time but you aren’t limited to one like the original Thousand-Eyes. 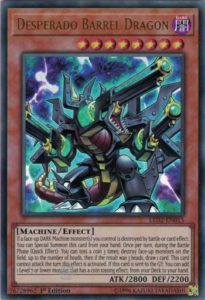 We also get a new hand trap that can add equips to your Relinquished or Eyes Restrict Fusion Monsters, just know the rulings say you can’t add a second equip to Relinquished or Thousand-Eyes Restrict I believe, but Millennium-Eyes can. Relinquished also got its own Fusion Spell that has a GY effect to equip more to your Relinquished-esque monsters and a monster that revives himself when you lose an Eyes Restrict monster and brings back said Eyes Restrict when it dies in an infinite cycle. This is one of the better decks to get legacy support, and it is a ton of fun. 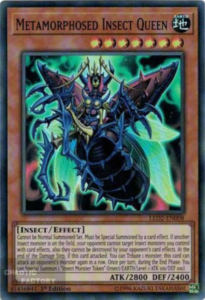 Another set of legacy support goes to the Insect-type as a whole for all you Weevil fans. We got a retrained version of Insect Queen that is actually good as it protects your Insects, lets you attack again by sacrificing your cards, and produces Insect Tokens. Sure it can only be summoned off card effect, but that is what the other legacy support does. We got a new Parasite that makes an opponent’s monster basically useless against your Insects and can get your new Insect Queen out. We also got a new Cocoon of Evolution that tributes an Insect with an equip (the Parasite treats the monster equipped as Insect) to summon any Insect ignoring the summoning conditions, so now there is an easy way to get out the Perfectly Ultimate Great Moth if the Insect Queen isn’t enough. We also got a final Trap Card that helps weaken the opponent’s monster, but that is only good for its artwork to be honest. Overall, nice Insect support for you bug lovers. Finally, for you Bandit Keith lovers, we got cards meant to help with coin flip decks. Thankfully this time effects don’t trigger if you get a specific amount of Heads or Tails, but they trigger based on the number of Heads you get. The new Barrel Dragon is a very nice card that is easy to summon and can clear out the opponent’s monster zone with great ease if you get enough Heads, 1 Heads = 1 Monster Destroyed. There is a main deck monster that helps trigger the summon effect of your Barrel Dragon since you won’t want to Normal Summon it more than likely. We got a new Field Spell to protect your Dark Machines and help summon more of your Dark Machines. Finally, we got a new Trap that helps you when you flip more than one coin and gets more powerful the more amount of Heads you hit, as well as having a GY effect for when you toss multiple coins you can treat all the results as Heads to help either version of Barrel Dragon. The coin flip deck will always be very gimmicky, but it is nice to get a boost for that mechanic. Yes I really said that, thank you Chazz. The next set of legacy support is very gimmicky, but it is fun to pull off. The boss monster requires two very hard to summon monsters, Armed Dragon LV7 and VWXYZ – Dragon Catapult Cannon to be exact. With that said, they helped you summon both Armed Dragons and VWXYZ pieces, but you need Ojamas. I know mixing Union Machines, Dragons, and Ojamas sounds strange, but when the deck works and gets the boss monster out, it is a very problematic card to deal with. I love the anime and the type of cards they inspire Konami to give to us. 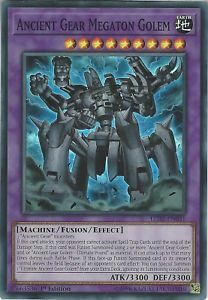 We did just get Ancient Gear support last year, but this support is centered around Ancient Gear Golem and the retrain it has so Crowler can be proud of you and you can graduate from Duel Academy. First off is the Fusion Monster that can attack up to the number of Ancient Gear Golems used if you used more than one, has the standard Ancient Gear effect, and replaces himself with Ultimate Ancient Gear Golem which you should never sneeze at. We got a searcher for Golem and cards that list Golem on it, and an effect your opponent should never trigger. Ancient Gears got their own archetypal Fusion Spell that can use the deck for materials if you use a Golem you control. Finally, we got a Trap that helps make an Ancient Gear much stronger, but it is honestly another card good for the artwork, which the artwork on it is amazing. Finally, we get to the support you Jesse Anderson fans will love, Crystal Beast support. We didn’t get the cards OCG had for about 4 years now, but we got a new Rainbow Dragon. 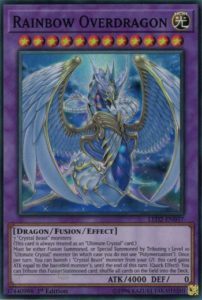 With this support, Rainbow Dragon, Rainbow Dark Dragon, and the new Rainbow Overdragon will always be treated as Ultimate Crystal cards so they don’t have to give Malefic Rainbow Dragon any support. 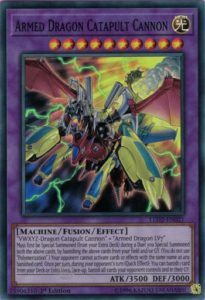 Overdragon is very similar to the original Rainbow Dragon, only you don’t have to wait to shuffle everything into the deck and you don’t have to banish every Crystal Beast to pump himself up. We got a trap to summon the new Rainbow Dragon using the 7 Crystal Beast monsters we have from the deck, yes to play the new Rainbow Dragon you still have to play all 7 Crystal Beasts no matter how bad some might be. We got a searcher for Crystal Spells and Traps and a searcher for Crystal Beast monsters that also adds a Crystal Beast to the Spell and Trap zone, but the artwork on the latter card is amazing and you have to look at it for yourself, thankfully this card is actually good unlike previous cards that were only good for artwork. 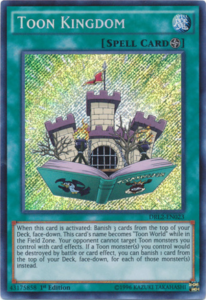 The best thing in the reprints area are the very elusive Toon Kingdom and Mimicat. Both are short printed as Rares, but at least they got another print. Ultimate Ancient Gear Golem gets its first reprint outside a Tournament Pack. They reprinted the two Crystal Beast monsters I would be willing to call good. They gave us Rainbow Dragon to update it to be an Ultimate Crystal monster, so I expect that on Rainbow Dark Dragon. Thousand-Eyes Restrict has another reprint, which is always great. The most competitive card to get a reprint though is Instant Fusion, there can never be enough Instant Fusion prints. Like I said at the beginning, this is mostly for casual players. The archetypes in here are really fun though, so if you wish to try them out I do recommend it. Crystal Beasts and Relinquished probably got the best support though. The Armed Dragon VWXYZ Ojamas does sound fun as well. This is a fun set like the last Legendary Duelists and like how the next Legendary Duelists should be.